Marble has a lasting beauty to it. Cararra and Calcutta marble are especially favored by lovers of the classic look. Make the countertop the focal point by painting it pure white. For a different look, honed finish countertops can be installed as an alternative to a glossy look. Cast quartz, black granite and soapstone make good material for honing. A honed finish provides a matte finish rather than the traditional buffed and polished glossy alternative. 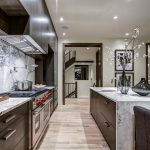 Black, white and gray colors in their different tones and shades give a classic look whether used on cabinetry or the walls and floor. Earthy colors like walnut, deep brown and tan also impart a vintage look. White and cream colors are prominent in the classic look. The wall cabinets and other wooden furniture surfaces are prominently white while fabrics and other soft surfaces are cream and other soft colors. The classic kitchen avoids the ornate detailing of the traditional look, and the clean flat look of modern styles. Detailing is done subtly and is restrained. Crown molding, furniture style toe-kicks and islands on legs will occasionally be seen but do not grab attention. Cabinet doors in the classic style have simpler detail. Shaker doors and shakers doors with bead molding work very well for this look avoiding the more ornate raised paneling in traditional styles. A classic look can accommodate different combinations in color, sizes, shapes and materials. 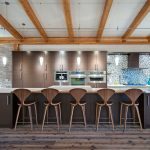 Visual effects can be added by installing pendant lights or accent lamps at different spots, walnut colored stools can be installed at a white island for a mix and match look, and a chandelier can be installed alongside industrial like LED pendants among other tweaks you can think of. Subway tiles especially in white impacts the look of the kitchen in a big way. For a unique classic look, for 2×4, 2×6, and 2×8 sizes. There is flexibility on the tiles and can be handmade or machine, glossy, crackled and so on. The classic/traditional look allows you more experimentation than any other style. You can make it truly unique building on the above elements.